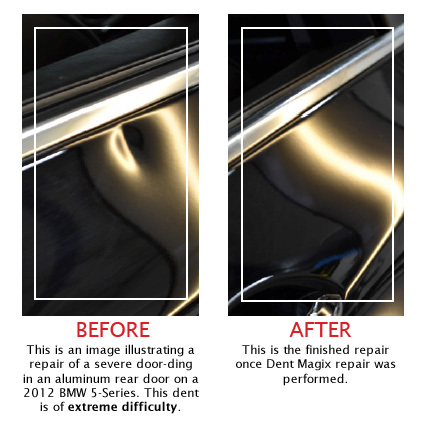 Dent Magix is the premier Paintless Dent Removal company in the Atlanta area. We are also a leader in Nationwide hail damage repair assistance. We are quick, efficient, quality minded and insurance approved. We cater to a Toyota the same way we would a Ferrari! Since starting our company in 1999, Dent Magix has become the Preferred PDR of Atlanta and the surrounding area. Utilizing our relationships with automotive retail service groups, network of collision repair centers and mobile service, Dent Magix of Atlanta L.L.C. is able and fully capable to meet and exceed customer expectations all over the metro Atlanta Area. In spite of this, Dent Magix has maintained a small business mentality allowing us to keep up with the ever changing Art of Paintless Dent Removal. Contact us today to get a free estimate on our services.